Ordered Lenovo. Will update when it comes. Hi sorry i dont know how this work. If i do an online order for 200$ how much do i pay you? and how do i get my refund. Which one of these do you do to Europe? You place an order from the stores I offer (check with me on IM first) and once you get your package, you fill my form. Then I do my work and you get your order refunded. Any order below 250$ would be charged 25$. Sadly I only offer USA and Canada. Last edited by De Luxe; 09-27-2018 at 09:17 AM. Waiting you to add me !! DeLuxe completed a Nike order for me in a timely matter, he was quick to start the refund and was always following up with me with updates on the order. He is the first refunder that you can actually ask questions to especially if you are new to refunding, He is easy to reach and gives prompt replies unlike refunders who take 24 hours just to respond. He is a super good guy, who is always willing to help. Words cannot describe how much I recommend him. Also he was mentored/trained from a high end refunder from a different forum, so he forsure knows his stuff! Currently he is working on two more of my refunds, i will update how they go! VOUCH VOUCH VOUC!! Okay let me start off by saying THANK YOU first off. PEOPLE THIS GUY IS LEGIT, I do so many refunds per week and he has been on top of it. Unlike other refunders who say oh fill out the form and just leave it at that, this guy will keep you updated throughout the whole process. I love it because even when I fall lazy he always asks me questions about the order and that helps me regain focus. You have to be on top of these orders to ensure they get refunded. COMMUNICATION will never ever be a problem with DE LUXE! He has done over 4 refunds from Target, macys, and best buy for me and that is all only for this week. Whenever a problem arises for my orders he will always take the matter in his own hands. Again bro, Thank You so much and lets continue to work!! Nope. 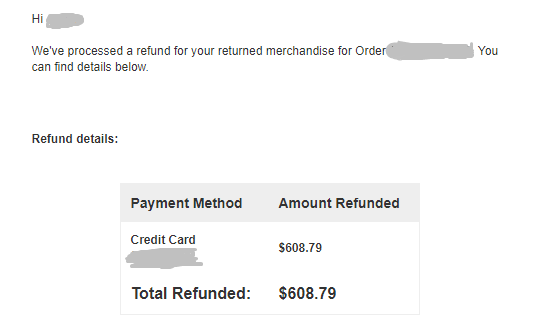 I had to simply wait for Nike to respond and received an email saying that my order was refunded. Replied to everyone on IM. Message me if you have any more questions. I recomand this guy to EVRYONE ! Verry responsive, keeps you updated all the process. The fill form is verry well made. Successfully made in one day a full and complete refund of 1.8K. Some sites you say cannot be signed, but how do you not sign when they ask you to?